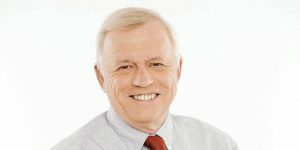 Born in Liège in 1954, Guy Lemaire joined th RTB in 1972. He is a freelance writer in sports writing. Among his first reports, there is a month at the German Football World Cup. His training, it is on the ground that he accomplished it. He is a man of radio and television whose name remains attached to numerous broadcasts. A generic characterizes the man. It is that of “Télétourisme”, the programm he has presented for 34 years. But it was far from the only one he created, presented or produced. “Gourmandises”, “Tour de chance”, “Bons baisers de chez nous” are just some examples. For the general public, it is to another field, that of heritage and tourism, that his name remains attached. He is still present in television in “Les ambassadeurs” where every Saturday he tells the story of sites or monuments. With a physique that has never really changed, and a talent that no one denies him, Guy Lemaire is a man of passion: theatre, gastronomy or piano in his spare time. Friand of Italian cinema, his agenda of young retiree will certainly not miss a variety of appointments.